Bairs Codoras Mennonite Church (Mennonite Church) belonged to the Lancaster Mennonite Conference. It is located in North Codorus Township, York County, six miles (10 km) southwest of York. Henry Newcomer, Ulrich Huber, Peter Hershey, Peter and John Houser, and George Garber were here by 1783. The first church, built after 1800, was razed, and a new brick church was built in 1895. It was part of the Middle York County circuit, with Richard Danner serving as bishop in the 1950s. By 1972 the congregation was affiliated with the Eastern Pennsylvania Mennonite Church. Landis, Ira D. "Bairs Codorus Mennonite Church (York, Pennsylvania, USA)." Global Anabaptist Mennonite Encyclopedia Online. 1955. Web. 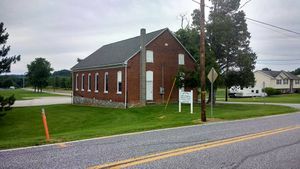 22 Apr 2019. http://gameo.org/index.php?title=Bairs_Codorus_Mennonite_Church_(York,_Pennsylvania,_USA)&oldid=163334. Landis, Ira D. (1955). Bairs Codorus Mennonite Church (York, Pennsylvania, USA). Global Anabaptist Mennonite Encyclopedia Online. Retrieved 22 April 2019, from http://gameo.org/index.php?title=Bairs_Codorus_Mennonite_Church_(York,_Pennsylvania,_USA)&oldid=163334. This page was last modified on 24 February 2019, at 13:10.